Take control of a multi-talented young doctor in his daily rounds at a lively hospital. It seems as though the Nintendo DS is turning out just how its creators wanted, like a hand turning a valve and opening a faucet of creativity, even amongst developers you wouldn’t expect much from. 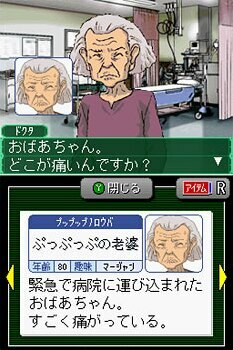 So it’s comforting (or maybe unsettling) that the DS has encouraged Spike, a company more known for its wrestling games and other harder-edged titles to create a slightly wilder product for Nintendo’s new portable. Though the game’s title is another glaring bit of Japanese wordplay, Tendo Dokuta is all about Tendo Dokuta — specifically, the young rookie resident you play in the game. Being fresh out of med school, Dokuta doesn’t have much to contribute at first, but he is working in the best hospital in the land, so that alone intends to give him plenty of opportunity to strut his stuff. 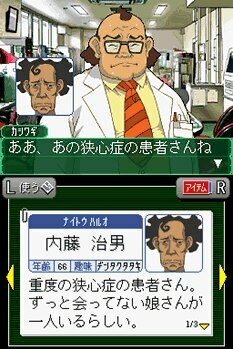 The game may be best described as a medical version of Capcom’s lawyer drama Gyakuten Saiban. Patients of all shapes and sizes will come in frequently with all sorts of ailments, including the eccentric but helpful supporting cast, like Florence the head nurse and Kyosuke the rather flamboyant looking managing doctor. When a patient walks in, you’ll use the touch screen to drag a medical chart icon onto them and begin to diagnose the problem. The chart can also be handed to fellow doctors who may assist you with second opinions or extra items. If the patient’s problem is more painful and requires further consideration, you’ll be prompted to feel around them to find the particular source of pain and use that knowledge to advance.